Durable and corrosion resistant coating for all ferrous and non ferrous metals. Apply directly onto rusty metal - no need for primer or undercoat. Approximate coverage 5m2 per litre. Touch dry 1-2 hours and recoatable in 4. Hazard Safety codes: R10, R21, R40/43, R50/53 and R65/67. 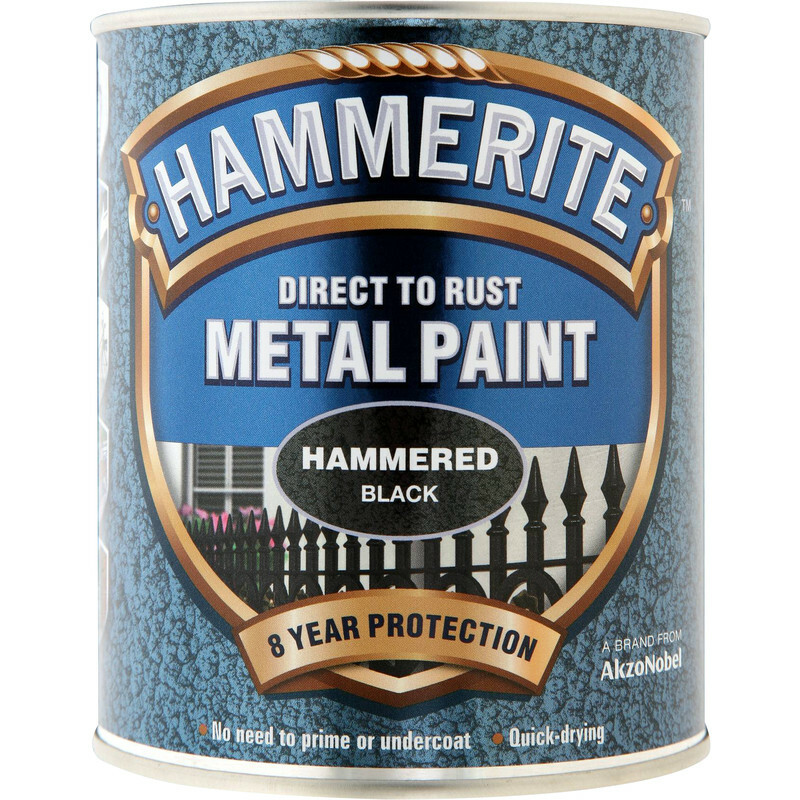 Hammerite Metal Paint Hammered 750ml Black is rated 4.9 out of 5 by 14. Rated 5 out of 5 by The Steelman from Best Paint ! Have been using Hammerite for years now for my steel work and it works for me !! Rated 5 out of 5 by Roy2 from Excellent paint Excellent paint for metal. Brushes on easily and doesn’t need great effort to get a shiny smooth finish. Looked good after just one coat, but gave it two as recommended for bare metal. Finish looks durable. Time will tell, but have used before with very good results. Rated 4 out of 5 by Dooze from Metal Paint Does what it says on the tin, Brill. Rated 5 out of 5 by john29 from Hammerite I have used this product often, so I am never disappointed. Rated 5 out of 5 by Diwali from Its reputation is well deserved Hammerite paint is always my first choice for rust treatment. After wire brushing I have painted both sides of three trailer wheels and parts of the suspension and still had some paint left over to do my mower. All items look good and I fully expect them to last the 8 years mentioned on the tin.